How are Bible-believing Christians in the late 20th century supposed to understand the crucial first chapter of Scripture? “In the beginning God created the heavens and the earth” (Genesis 1:1). Not only are these words inspired and inspiring, they are also a focus of much controversy. Evidence advanced in school textbooks and classes about the millions of years proposed for human prehistory can seem so overwhelming, so potentially destructive of faith in God’s Word. The Fundamentals was a series of 12 volumes advanced to defend biblical Christianity in the face of theological challenges from Protestant liberals or modernists. One of the threats to the Bible, in the minds of many fundamentalists, was the rise of evolutionary thinking sparked by the publication of Charles Darwin’s The Origin of Species in 1859. They were right to fear the potentially destructive effect of Darwinism. Many fundamentalists taught that biblical infallibility demanded an adherence to a 6,000-year-old earth and a literal understanding of the six days and nights of Genesis 1. In some religious circles, this view became the litmus test of biblical orthodoxy. However, in 1909, The Scofield Reference Bible, inspired by fundamentalist perspectives, made certain concessions to Darwinism by popularizing the Gap Theory. The Gap Theory postulated that God’s originally perfect creation had been wrecked by the pre-Adamic rebellion of Satan the devil, who was formerly the cherub Lucifer. Scofield and others felt that such scriptures as Revelation 12:7-9, Isaiah 14:12-15, Ezekiel 28:11-19 and Job 38:1-7 could be harmonized to support an account of a primal cosmic clash that left the earth “without form, and void” (Genesis 1:2, King James Version). Thus the Gap Theory sought to outflank Darwinism. It postulated Satan’s rebellion as the explanation for the destruction of the dinosaurs and other geologic discoveries. Some in the Bible-believing community embraced Scofield’s position. Others did not. Some of the dissenters from the Gap Theory held as high a view of divine inspiration as Scofield, and recognized the theory’s weaknesses. The concept of a satanic rival of God so strong as to wreak havoc on God’s creation, they pointed out, called into question the Creator’s all-knowing, sovereign control. They also felt that the Hebrew text did not support Scofield’s claim that the word translated was in Genesis 1:2 should be interpreted to read became. The battle over Genesis 1 heated up with the dramatic increase in scientific knowledge in the 1960s. Some concerned Christians who wanted to hold to the authority of Scripture began to hear about scientific creationists. Yet many leading creationists were focused more on validating Noah’s Flood as a mechanism for explaining the geologic record than they were on Genesis 1. This point was and is often lost in the debate. A painting of Galilee demonstrating his telescope to a visitor. Advances in science threw many Bible believers on the defensive. But the value of the Bible towers far above science. Defenders of the Bible lost face in the 1600s when Galilee was forced to recant for teaching that the earth revolved around the sun and not vice versa. Galilee’s telescope has become a symbol of a shift in Western culture from a time when faith was dominant to a world bewitched by the claims of science. But science doesn’t always get it right. Another astronomer, Percival Lowell (1855-1916), found that a telescope can work against science as well as for it. 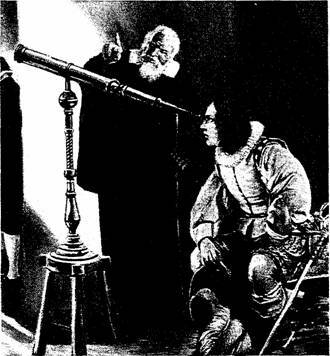 Inspired by Giovanni Schiaparelli’s speculations about the existence of canals on Mars, Lowell constructed a private observatory in Flagstaff, Arizona, to investigate the red planet. He thought he saw evidence of a doomed race constructing a planetwide system of irrigation canals. It should be noted that Percival Lowell added to our knowledge about the universe. After his death, his theories about the existence of the planet Pluto were proven correct. But his speculations about Mars remain an example of specious assumptions. The lesson is clear: Advancing knowledge overturns many scientific theories. Many scientific claims made about the age of the earth, the beginning of life, and the history of the solar system are not ironclad. The verdict is still out. In a letter to Time magazine (Nov. 1, 1993), Michael Behe, associate professor of chemistry at Lehigh University in Pennsylvania, chided the magazine for its “childlike trust” in the pronouncements of science. Dr. Behe challenged the reigning notion “that science can explain it all.” He is skeptical of such “Swiss-cheese” theories that life began in undersea hydrothermal vents or arrived on meandering comets. These ideas, Dr. Behe says, are full of holes. Dr. Behe raises an important point: Science has been wrong before. It is not just believers “in the Bible who need to maintain an open mind on the fascinating subject of origins. Scientists should, too. Most careful students of the Hebrew text refused to enter the fray. They felt uncomfortable with a theological system that seemed to be at war with modern science. A middle position had emerged among conservative scholars. These theologians and Bible teachers remembered the epochal clash between the Italian scientist Galileo Galilei (1564-1642) and the church. This, argues theologian Richard Muller, is “a description of the world simply as it appears to the eye and relates to the individual’’ (The International Standard Bible Encyclopedia, Vol. 4, page 1113). Even today, we refer practically but nonscientifically to sunrise and sunset. Much of the Bible’s description of the natural world is in this earth-centered style, as we see in such passages as Psalm 104 and Job, chapters 38 to 41. Many who abstained from the creationist debate felt that God had not intended the earth-centered Hebrew view of the world to be compared unfavorably with 20th-century science. What was God teaching the Hebrews, and all humanity, in the inspired account given in Genesis 1? Did God inspire Bronze Age Israelites to preserve a scientific account of origins, or did he have something timeless and more universal in mind? Was the God of Israel, the God of the Bible, concerned about inserting secret codes into the creation account that could be later used to outflank Galileo or Darwin? Or was he giving those who read Genesis 1 an alternative to the paganism that surrounded them? Canadian writer James Houston, a former chancellor of Regent College. wrote about Genesis 1: “It is not a primitive account of how the universe began, but about who brought all things into being” (I Believe in the Creator, page 46). Genesis 1 taught the Israelites, who were tempted to compromise with the seductive attractions of paganism (Exodus 20:4-6; Jeremiah 10:1-5), that there is only one God. The being they worshiped as Yahweh was the great Creator himself! “If He had chosen to inspire a scientific treatise,” insists David E. O’Brien. “I have no doubt that He would have given us one that battalions of Einsteins would need millennia to unravel…. He carefully chose not to burden his revelation with scientific language that would rapidly find itself outdated” (Today’s Handbook for Solving Bible Difficulties, pages 168-169). Many authors have seen that the climax of the Hebrew creation account is the seventh day (Genesis 2:1-3). However, few people would interpret verse 2 — “on the seventh day he rested from all his work” — to mean that God needed a literal time-out. God, of course, doesn’t need to rest. Rather, the logical sense of Genesis 1 pointed out to the Israelites that creation itself was a reason to praise and worship God. Those who read Genesis 1 in Hebrew appreciate the beauty of the language and the tightly connected literary structures. To Ronald F. Youngblood, the creation account “is written in measured and majestic prose…. Its teaching is intended to encourage us about who we are and where we come from and its emphasis is oriented toward life rather than death” (The Book of Genesis: An Introductory Commentary, pages 21, 23). Students of the original language remark upon the rhythm, the pacing, the simple but moving energy of the language, the sense of God’s effortless control as well as his delight in his creation. In this context, then, Genesis 1 soars as a Hebrew song of joy, the majestic overture to the grand themes and messages of the Bible. The Hebrew language is lilting and forceful. It is studded with lively phrases. Genesis 1 is no exception. Verse 2 contains the musical phrase tohu wabohu (“formless and empty”), roughly equivalent to our colorful English phrases helter-skelter, willy-nilly or mishmash. Many biblical scholars feel that Genesis 1:2 conveys a vivid word picture that encouraged Moses’ original audience. Victor P. Hamilton, in his stimulating study The Book of Genesis: Chapters 1-17, explains that the Spirit of God “hovering” over the face of the waters presented a similar word picture to God’s description of himself in Deuteronomy 32:11. Everett Fox concludes, “The image suggested by the word (‘hovering’ or ‘flitting’) is that of an eagle protecting its young” (In the Beginning, page 5). No Contest: Why the argument over Genesis 1? The simple and beautiful description of the sun and moon as greater and lesser lights appointed “to govern the day” and “to govern the night” (verse 16) is another example of the artistic language employed. God inspired the creation account to offer the Israelites and all peoples an earth-centered description of creation. We do not know how God did all this any more than we know how Jesus turned water into wine or raised Lazarus from the dead. The point is that we know it happened. The exact mechanism is not revealed, nor need it be. God needs no mechanism to accomplish anything. His will is sufficient to accomplish his purposes. God inspired a skillful arrangement of words, phrases and sentences to express his satisfaction with the natural world. The physical creation is the stage for the great drama of redemption. Genesis 1 assured the early Israelites — surrounded by polytheistic idolaters — that their God was superior to anything and everything else that was worshiped. The powerful word picture of Israel’s God hovering over the waters as a protective eagle superintending its young is warm and loving. It shows a God who is sovereign, a God who stands above and outside the created order, a God not subject to our world of space and time but the majestic Creator of it all. To the devout Hebrew mind, the God of creation was their loving protector. He was personally and intimately involved with his people. To ancient Israel, the creation itself proclaimed the Creator’s lavish and abundant care for his creatures. The God who hovered as a protective eagle in Genesis 1:2 was the one who later led his people out of Egypt and through the Red Sea (Exodus 19:3-4) and appeared as a perpetual source of help to the people of Israel. The eagle image of Genesis 1 thus reappears in the “eagle song” of Mt. Sinai and the Song of Moses (Deuteronomy 32:1-43). And so this Hebrew song of joy superbly opens the Bible. In the words of the evangelical thinker Francis Schaeffer, the point of the chapter was spiritual: “The universe had a personal beginning…. Before ‘in the beginning’ the personal was already there. Love and thought and communication existed prior to the creation of the heavens and the earth” (Genesis in Space and Time, page 21). Genesis 1 is a call to worship. It was designed to produce a deeply emotional reaction of thanksgiving to God — not to serve as a theological football between science and faith. We abuse the biblical text when we force Hebrew words and thought patterns into structures they were never meant to fit. Genesis 1 is a superb theological masterpiece. It is in a class by itself.